MicroRNAs (miRNAs) are small conserved noncoding RNAs which function as posttranscriptional regulators of gene expression. 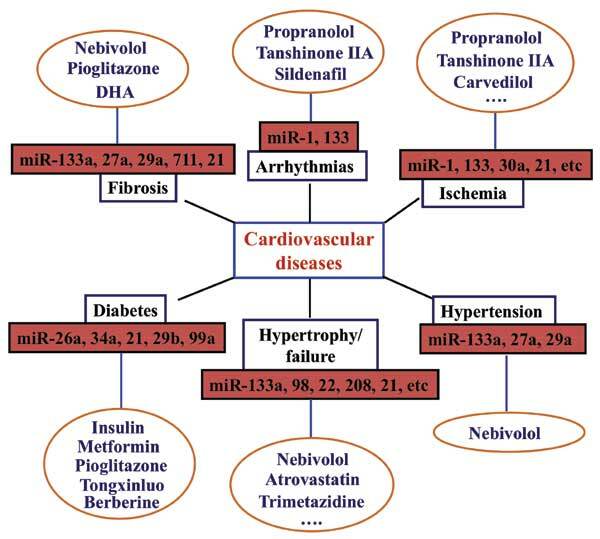 Studies over the last 20 years have revealed the essential functions of miRNAs in regulating cardiovascular biology (such as cardiovascular cell differentiation, growth, proliferation and apoptosis) and crucial roles in controlling cardiovascular disease (CVD), indicating the potential of these small molecules as therapeutic targets and/or agents for CVD. Moreover, miRNAs in the circulation or other body fluids are stable and readily detectable, and more importantly often disease-associated, which makes them promising novel biomarkers for diagnosis and prognosis of CVDs. Furthermore, emerging evidence uncovered miRNAs as new targets and/or regulators of cardiovascular medications given the ability of miRNAs to interact with some cardiovascular drugs, which opens up new opportunities for the research and development of novel CVD drugs. Herein, we summarize current knowledge regarding the potential applications of miRNAs in the therapy of CVD, including myocardial ischemia, cardiac hypertrophy/heart failure, interstitial fibrosis, arrhythmia, diabetes and hypertension and discuss the therapeutic potential and challenge of miRNAs in drug discovery. MicroRNA (miRNA), drug discovery, myocardial ischemia, cardiac hypertrophy, cardiac fibrosis, arrhythmias, heart failure, hypertension, diabetes, therapy, biomarker.